First off, many thanks to the lovely folks at Folding Trees who featured my quilled Ring of Keys last week. And a warm welcome to those of you who've found your way here via that post or from Craft, Paper Crave, and all the other sites that linked to it. I could definitely relate to what was said about quilling having more uses than making flowers. Always on a quest to find novel applications of rolled and shaped paper, I love coming across others who quill the unexpected. 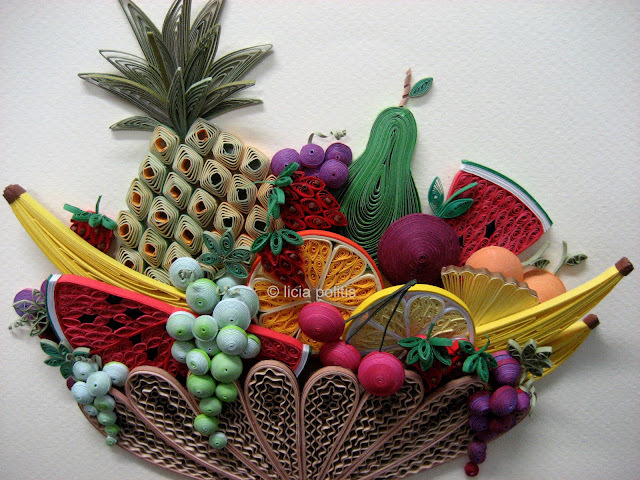 Licia Politis is one who not only makes flowers and pretty paper beads; she also has the ability to create unique paper art. Here's a beautiful piece she quilled; it's called Fruitful. It was awarded first place at Australia's 2007 Sydney Royal Easter Show and Royal Queensland Show, and first place at the 2007 North American Quilling Guild competition. It was also featured on Martha Stewart's television show, at the Museum of Bribane, and Hazelhurst Gallery in Gymea, New South Wales. 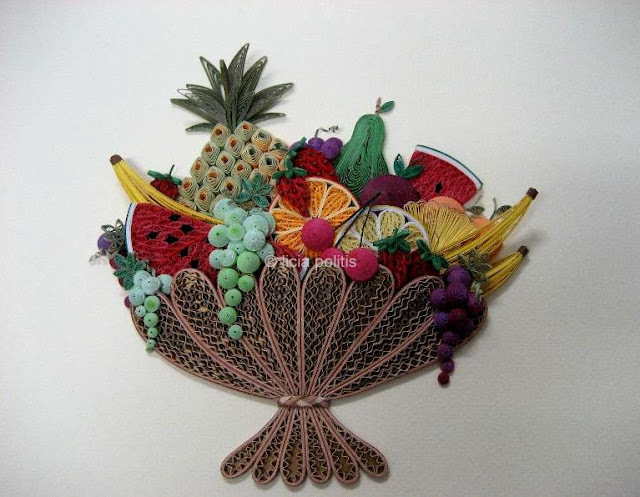 I like the juxtaposition of combining crimping, a technique often seen in antique quilling, with the bright, modern fruit. The pineapple uses a technique Licia devised called the vortex coil. 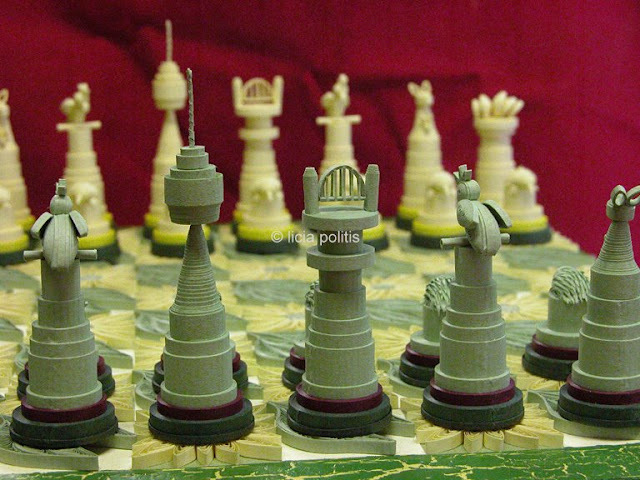 You may have already seen a standard quilled chess set if you're familiar with the kit that's available from many online suppliers. Licia's set is exceptional because she cleverly designed it with her homeland in mind. She chose icons of Sydney to represent the chess pieces - the Harbour Bridge as the queen, Centrepoint Tower (Sydney's tallest building) as the king, the Opera House as rooks, cockatoos on perch as bishops, kangaroos and joeys as knights, and echidnas (spiny anteaters) as pawns. Licia found inspiration for the beautiful green and gold board (Australia's colors) in the work of Australian illustrator/conservationist/feminist May Gibbs. May's famous flannel flowers and gum leaves make up the checkerboard pattern. 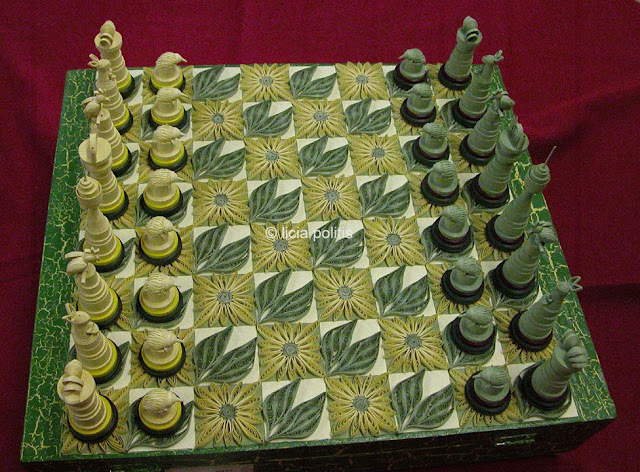 The set took her about three months of spare time to complete and matte finish varnish protects the board and pieces. 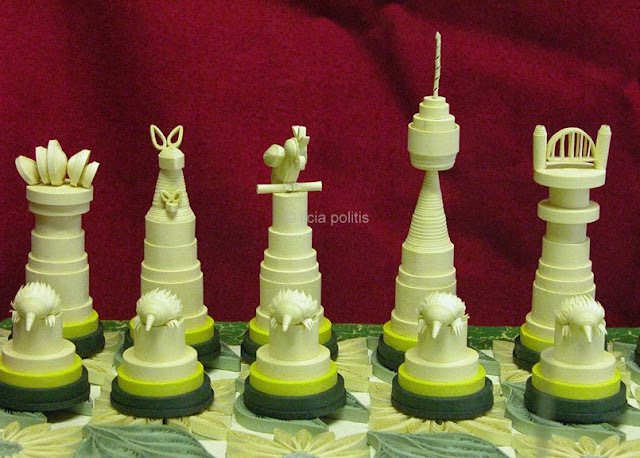 Licia also won several well-deserved awards for the chess set, including the 2004 English Quilling Guild's Rose Bowl, first prize in the Sydney Royal Easter Show, overall prize of Excellence in the Sydney Paper Art Festival, and she was featured as Artist of the Month in an exhibition at Hazelhurst Gallery. Just like Yulia Brodskaya, Licia is bringing well-deserved attention to paper filigree. The countless ways coils and scrolls can be arranged make it an incredibly versatile medium. Wow - absolute perfection! Thanks for sharing this, Ann. Oh my, what beautiful paper things you have made! Just looking at all of them makes my hands cramp up! The fruit bowl is my favorite...or maybe the chess set! Wow!!!! Stunning!!! It is truly art and I can only imagine how long it took to complete each piece! Thanks for sharing it with us! Navegando pelos Blogs de Quilling, encontrei o seu e não poderia de deixar de te dar os Parabéns pelos magníficos trabalhos em Quilling. O jogo de xadrez, não tenho palavras para expressar tal trabalho. Thanks for sharing Anne and great keys on folding trees! I love perusing your blog, I'm always running across something I haven't seen before. Thank you for showing Licia's artwork. She is truly an artist, and a nice lady. She even took the time to email me a copy of her how to for what I call the Licia coil (vortex). Quillers are the most generous people. 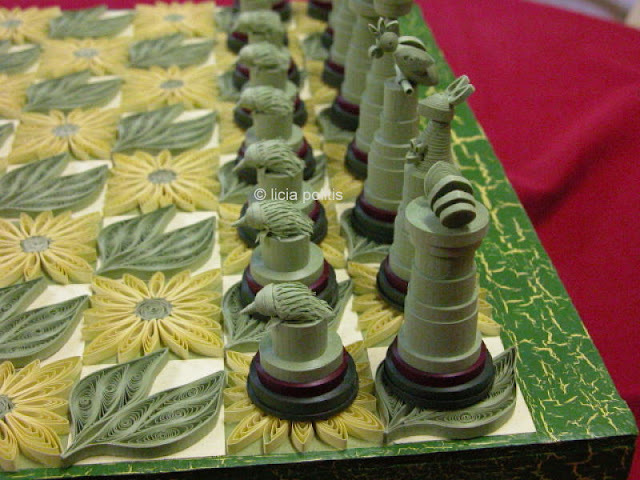 I can not even begin to describe this chess board's beauty! Licia, are you for real?????????? So precise work! Wonderful details! I am awed with the precision and perfection of her creations. Incredible.